PC/Notebook usability rating: 4/5. You need a receipt to complete the survey. Smartphone usability rating: 2/5. You are not recommended to finish The Money Shop Customer Feedback Survey via smartphone, since it may take you more than 20 minutes to finish. 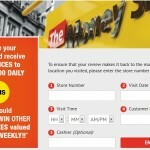 Use the information on your receipt to enter the survey on your PC. The Money Shop, same as Money Mart, Loan Mart and Insta Cheques, belongs to the US-based financial service group, Dollar Financial Group. Store 5352 Southport . Just back from changing some dollars , Lauren served me and was polite , pleasant and helpful . I have used this shop many times and will continue to do so. Very competitive exchange rates and excellent staff. Many thanks . Just left a comment but forgot to include store number MS5613 excellent service from Kelly who was efficient and pleasant. I received money from Western Union and also exchanged some pounds for Euros and it was the best rate I could find. I will certainly use Money Shop again! Went to Money shop for the first time today. I received money by Western union then exchanged some pounds into Euros. The rate was the best I could find. The Assistant Kelly was excellent. Pleasant and efficient. I will certainly use money shop again. Visited this store this morning and was served by Jen got a good deal for my euros . She was very helpful and cheerful store number 5182 .
visited store 5286 for some euros, good rates and excellent service. served by vanessa who was extremely helpful and friendly/professional. came out of the store on a high, thankyou. I regularly visit the local Money Shop in Lowestoft to purchase foreign currency. All staff members are always very helpful and pleasant. Today I purchased some euros and was served by Lyn who again had a very pleasant manner and was helpful with my purchase. Your exchange rates are always very competitive and beat all other outlets. I shall continue to use your facility in Lowestoft. Quick, efficient service with a smile. i was attended to by comfort at store number....5031 woolich,i was highly impressed by her customer services she behaved so good to me she is well behaved. Diana has been a nice person,very accommodating and receptive. The store number 5460 has always made my transaction very simple and quicker. Ability to make Western Union transfer based on previous data using Mobile Phone Number really made the process so much more accessible. Brilliant innovation . . . . will definitely use again and recommend to friends. The use of Western Union is interesting. It makes money transfer more accessible, easier quicker. Very courteous and helpful staff. Would highly recommend to my friends. I have used the money shop for many years,the best shop is store nr.5173 in Canterbury, good service ,specially Mr Martin,is very helpful person,is nice person who know to speak with people, fast in servising, well done Martin,thanks for you help. Store Number 5182 when dealt with by Nicole is a professional, efficient and pleasant experience. She is friendly and very helpful, advising best rates. Excellent knowledge of all currencies. Attended at Store No 5333 on 76/12/2015 to purchase Polish money. Staff member Evelyn was very courteous and did everything to help. I like the service and the attention which was provided to me. Staff were polite,knowledgeable and extremely helpful. Will definitely use the store number 5071 Hamilton in the future. I always use store number 5198 in Stockport to change sterling into Canadian dollars. I always find the staff extremely friendly and helpful there. I was served yesterday (01/12/15) at 12.45 by Genia. I Love it. EXTREMELY HELPFUL, Thanks a lot.The staffs are very helpful. I use store N0 5425 IN Bletchley, QUEENS-WAY. in Ashton Under Lyne. The staff are very helpful and advise on the best rates. one member of staff Brian, is always bright and cheerful and ready to advise. There were two staff on duty the day I went there to send some money. RITA your staff member at store number 5929 who attended to me was very polite and helpful. Keep up the good service. Slight delay in serving but not a problem. Staff friendly and helpful. I have used many outlets over the years but, because of the rate, changed to Money Shop two or three years ago and have stayed with them since. Quite a few competitors in Blackpool town center but I am very happy to stay loyal to this firm. I use them about four times a year.